The Ops Warriors need help, and Black Hawk answers the call. But help comes with a cost as the Ops say goodbye to one of their own. The Masters M.C have a visit from the the Devil’s Iron MC during Bike-Week.The Whipping Post dungeon sets the stage for both pain and pleasure. Will the women get their fill of pleasure or pain? Or pleasure from pain? Sacred Hearts MC. Black Diamond MC. We collided as clubs in order to make things happen but it was our hearts and bodies that told our stories. We may take what we want from each other but we both walked away knowing ourselves more than we had to begin with. Two dangerous clubs will need to learn to work together as danger blows into town. Ant will do anything to save Morgan. The humans have no idea of the trouble that lies in store for them. 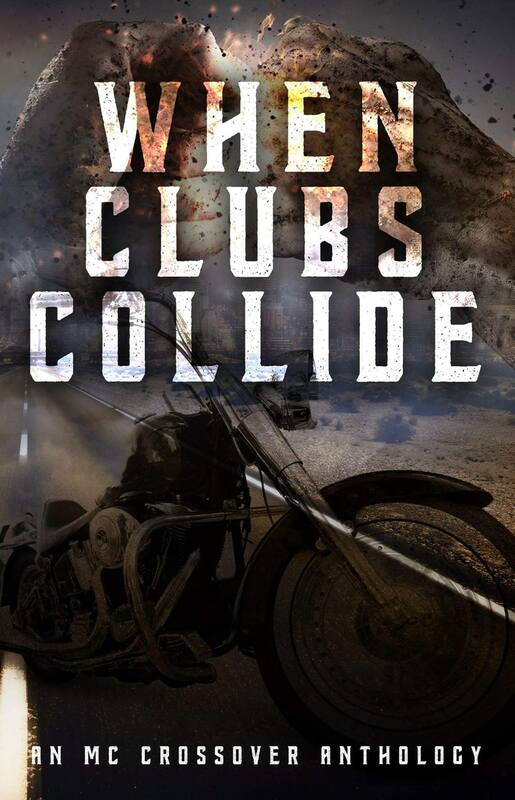 The Rage Ryders MC and BlackPath MC are brought together in a Collision Course to destiny. Two separate clubs fighting to keep their territories and families safe while building a future. When a lunch date ends badly for Pearllene and Miss Catherine, the enforcer for the Death Dwellers, Mortician, and Edge, the enforcer for the Soulless Bastards, must form an alliance to save them. The mother*fuckers who dared to mess with what is theirs, need to be taught some respect . Revenge is everything it’s cracked up to be. The Devil’s Crew is out for blood when Kane’s sister is kidnapped. The Heaven’s Rejects are preparing for war when another club invade their territory. Can both clubs put rivalries aside and unite to take down a common enemy? Avelyn Paige is a born and raised Indiana girl. While she may be a Hoosier by birth, she is a Boilermaker by choice. Boiler Up! She resides in a sleepy little town in Indiana with her husband and three crazy pets. Avelyn spends her days working as a cancer research scientist and her nights sipping moonshine while writing and book reviewing. Avelyn loves everything paranormal, Cajun culture, and wants to try tornado chasing as a hobby when she finally grows up. She just has to get over that pesky fear of thunderstorms first. Avelyn also enjoys collecting voodoo dolls from her trips to New Orleans. I write beautifully flawed characters who ultimately find, perfection is not a prerequisite. Our flaws are what make us unique and some flaws compliment each other better than others. My world would stopping revolving if not for heavy rock music (and the wonderfully talented people who make it.) Music and it’s makers will definitely be strongly visible in my work. I listen, I remember…I listen, I’m inspired…to write…to love…to f**k…to live. Carson lives in the South with her two sons, her three Great Danes, and the adopted shelter dog that keeps everyone in line. Books have always been a part of her life. Nothing is better to Carson than curling up and relaxing with a good story by losing herself in someone else’s world while leaving hers behind. Writing stories and growing as an author with each book published, is a goal Carson wishes to reach. Her aspiration is to have a reader know when they see her name on a cover, they can trust in the fact there will be a good story as they flip the pages. As an author, she hopes to bring you into her different worlds, giving you a chance to escape everyday responsibilities if only for a few hours. Emma loves writing hearts and flowers romance as much as she loves taking a walk on the dark side, writing in both contemporary romance and dark suspense. Love is always only a happily-ever-after away, even if sometimes it is a little twisted getting there. She lives life positively with writing, reading, music, and photography being her passions. The important things she needs to surround herself with are family, friends, and furry creatures. She loves giving hugs as much as receiving them and winding down with good food, good friends, and a nice drink of the alcoholic variety when she pops her head out of her writing cave. Be who you want to be and keep jumping those hurdles. They are only put in front of us to keep us on our toes. Peace, love and live life. Geri Glenn is the Amazon best-selling author of the Kings of Korruption MC series. She lives in beautiful New Brunswick, Canada and is a mom to two beautiful, but slightly crazy little girls. Geri has been an avid reader for as long as she can remember. She can usually be found curled up in a comfy chair, reading on her iPad both day and night. Geri is an incurable night owl, and it’s not uncommon for her to still be awake, reading at 4 am, just because she can’t put the book down. Writing the first book in the series knocked off the #1 thing on Geri’s bucket list, and publishing it has been an absolute dream come true. She hopes you all love the Kings as much as she does. There is nothing better in this world than being an author! I have an amazing supportive family, I have three children, one boy and two girls. They are the lights of my life along with my husband whom I adore. Without their support I would not have become a writer! Jacqueline grew up in the rural southeast and is the youngest child of a large and rowdy family. Reading was an escape when there wasn’t much else around to do. She loves everything from classical literature to true crime and everything in between. With her two children grown and gone, she’s surrounded by a menagerie of adopted pets and a two-legged thief who refused to give her heart back after a night of karaoke. With a day job and a dream job, her writing is a steamy combination of real life and seeking to answer the age-old question of what would happen if…and then characters come along and completely derail the plan. Letting them have their say provides plenty of sleepless nights and an endless combination of coffee and wine, but she hopes you enjoy their stories. Kat Kelly is living her dream and writing books. She’s always been an avid reader and still devours books in her spare time. She also enjoys football, socializing, music, eating, and jokes. In her head, she’s the ultimate biker babe. In reality, she’s an ordinary girl-next-door and a native New Orleanian. Since the release of Misled in December 2013, she’s been living her dream of writing books. In August 2015, her life took a dramatic turn with the diagnosis of Stage 2B HER2 Positive Breast Cancer. She underwent a double mastectomy, lymph node removal, and breast reconstruction in February 2016. The support of her family, friends, and fans helped her to stay strong and keep her head up. #F*ckCancer became her rallying cry. Now located in the Houston area, she is once again cancer free. Her hair is growing back and her nails are returning to normal. Currently, she is plotting her next book. I have been an avid reader for most of my life. When I was younger I use to sit and fill spiral notebooks full of stories for my grandmother. As I got older I took the jobs needed for raising my boys as a single mom until I met my now amazing husband. I have stopped working in the last three years and started promoting authors, then I blogged and reviewed for authors, which lead me down the path to writing and creating characters and stories. I love creating behind the scenes with my writing getting to use my imagination and write the story as it comes to me.I am loving the people I am meeting and the support system I have found. I have always been an avid reader and have had an active imagination. When my sister became sick in 2015 I spent alot of time in doctor offices and hospital rooms. I filled that time reading. My kindle and laptop became my goid friends. I started writing storylines and doing background research. My sister convinced me to follow my dream so I did and the rest is history. My sister passed in Febuary 2016 and I published my first book, Never Forever, in March 2016. I say I am learning as I go and that is true. I’ve been lucky to make good friends in the indie book community and I work with some of the best. I don’t know what is next but I am excited to meet it head on. I have been married to my husband, Charles, for 22 years and he is my rock. I have two grown son.